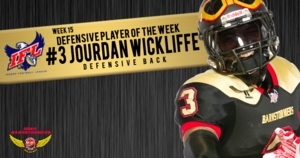 DES MOINES - Iowa Barnstormers defensive back Jourdan Wickliffe was named the Indoor Football League’s Defensive Player of the Week for Week 15, the League announced today. Wickliffe (6'1, 205, Eastern Illinois) earned IFL Defensive Player of the Week Honors after leading the Barnstormers top-ranked defense in a victory over the Arizona Rattlers in wek 15. Late in the fourth quarter, Wickliffe broke up a Rattlers pass on fourth down and turned the ball over. The fourth down breakup proved to be pivotal as it effectively prevented Arizona’s attempt at a comeback. In addition to his pass breakup, Wickliffe also led the Barnstormers with seven tackles. This is the second time Wickliffe has been named Defensive Player of the Week this season, earning honors in week 11. The Indoor Football League awarded quarterback Jake Medlock of the Cedar Rapids Titans with Offensive Player of the Week, while wide receiver Damond Powell of the Sioux Falls Storm earned Special Teams Player of the Week. Wickliffe and the Barnstormers hit the road to take on the Sioux Falls Storm this Friday, June 8 in an attempt to secure home field advantage in the playoffs. The team will return home to Wells Fargo Arena on Saturday, June 16 to face in-state rivals the Cedar Rapids Titans. Kickoff is scheduled for 7:05 p.m. Contact the Iowa Barnstormers front office for tickets 515-633-2255. The Iowa Barnstormers are celebrating the fans on Saturday, June 16 as they take on in-state rivals the Cedar Rapids Titans. It will be a game like no other filled with giveaways, contests, and fan experience opportunities! Don’t miss out on the high-flying action, contact the Barnstormers front office at 515-633-2255 for tickets.